A mile downstream is the town of Cardigan. St Dogmael's has a small but useful supermarket and a number of public houses and restaurants, there are excellent facilities for launching boats, canoes and kayaks. St Dogmael's village is famous for the remains of a 12th century Tironian St Dogmaels abbey, which was in its day one of the richer monastic institutions in Wales. It was once a marcher borough, described in 1603 as one of five Pembrokeshire boroughs overseen by a portreeve. The abbey has just recieved funding to develop it's visitor centre and attract more tourists. The new café is excellent! Plays by Shakespeare are performed in the Abbey Ruins annually in the summer. Some of the actors are from the local area, others come from all over Great Britain and return regularly. 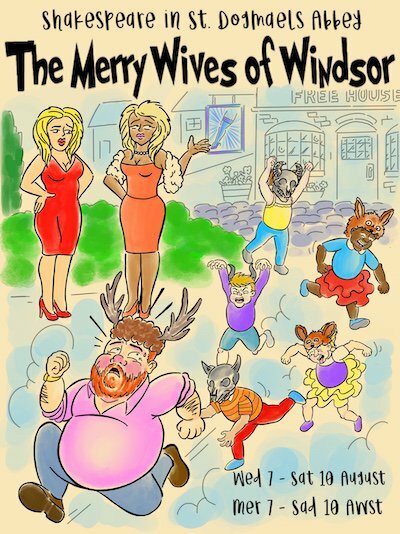 This years play is 'The Merry Wives of Windsor' Wed 7 – Sat 10 August, 2019. With live music and spectacular stage effects, the Abbey Shakespeare Players' 33rd annual production will make the most of the atmospheric backdrop of the St Dogmaels Abbey ruins. Please dress warmly. Chairs provided. In 2006 the village won the Wales Calor Village of the Year competition. The village is twinned with the village of Trédarzec in Côtes-d'Armor, Brittany. A short drive from St.Dogmael's are the Preseli Hills (Mynyddoedd Preseli), a wide stretch of high moorland with many prehistoric monuments and the source of the bluestones used in the construction of Stonehenge in England. The dramatic Pentre Ifan Neolithic burial chamber is well worth a visit. Walks around St.Dogmaels including the Pembrokeshire and Ceredigion Coastal footpaths.